Here are 5 things for PR pros to know from Davos Tuesday morning. All this week, PRWeek’s Breakfast Briefing will feature snapshots from on the ground in Davos, where the World Economic Forum is taking place. Salesforce says 93% of people believe companies should positively impact society. 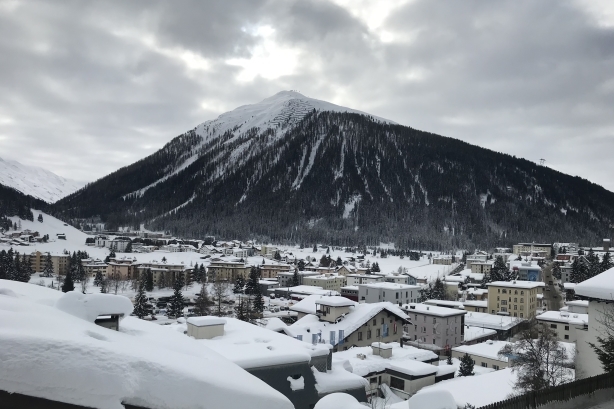 It’s in Davos this week for the World Economic Forum, along with 150 other global brands that have taken over storefronts in the Swiss ski resort - "to talk about the future of our world, because business is the greatest platform for global change." Despite cynicism about the event, making the world a better place is high on the agenda in Davos. Optimism was in the air at the We Are All Human and Global Citizen Forum WEF launch event Monday. "There’s never been a better time to be a young girl," said We Are All Human founder Claudia Romo Edelman. Unlike at Cannes in June, there are many senior comms execs in attendance at Davos. They’ve flown in from all over the globe, supporting their CEOs and C-suites and pursuing corporate goals. PRWeek spotted Mastercard’s SVP of global marketing Rose Beaumont and Cargill’s corporate VP of global corporate affairs Devry Boughner Vorwerk Monday night. "This is where stuff gets done," said Beaumont. One must-attend event for women at Davos? APCO’s Women’s Leaders Reception. Attendees included hundreds of women in communications, marketing, finance, NGOs, and government. APCO’s Margery Kraus said Davos is a chance to get out of the bubble, generate ideas for clients, develop future business strategy, and catch up with global leaders. Survival guide for women at Davos: "Keep your boots on, forget the heels," said Adecco’s Joyce Russell. "I’ve formed some of the best relationships in the line for the bathroom - talk about your life, not just your work," said Apolitical’s Lisa Witter. How to repel sexual harassers? "Bring a lot of dog repellent spray," said former New Zealand Prime Minister Helen Clark.